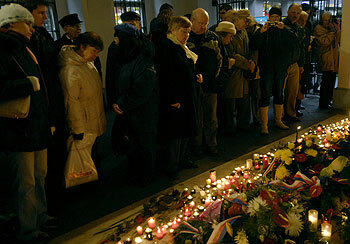 On Nov. 17, Czechs, and perhaps Slovaks too, marked the anniversary of the so-called "Velvet Revolution" of 1989. The event passed almost unnoticed in the foreign press and media, yet it was a significant date in the newly reestablished democratic state of Czechoslovakia. It was the 18th anniversary of the fall of Communist rule in central Europe and the rise of civil society. What has become of this revolution inspired by democratic freedoms? The Decline of Democracy and 'Civil Society' in the West? I recall at that time, as a young reporter from Canada, celebrating and walking though a breach in the Berlin Wall, and then witnessing the events on the streets of Prague. Today I am a central European and European Union citizen. But the memories of that period remain vivid in my mind, as does the sense of euphoria I felt back then. Like many in the crowd, I was looking forward to better times to come. Luckily, for those like me gathered in Leipzig's main square or Prague's national square, the ultimate outcome was peaceful, and we were all hopeful for better times to come. Looking back on those events now makes me feel somewhat disappointed and disheartened. Things have since gone wrong. Shortly after the Iron Curtain fell, the Czechs and Slovaks split up into the Czech Republic and Slovakia. And then there was a sense that something was running afoul. The separation of the Czech-Slovak federation into two states in 1993 was the first blow to civil society in my view. Unlike in Canada, which has had several referendums on Quebec's quest for independence, there was no such popular consultation held in either Prague or Bratislava. The president at the time, Vaclav Havel, said and did next to nothing to impede the fracture of the federation and stood by as the former Czechoslovak state was swept into the dustbin of history. Why? That's up to the historians to determine in a much needed examination or post mortem of those opaque operations. Thankfully, however, unlike in the former Yugoslavia, the Czechs and Slovaks' "Velvet Divorce" was a very peaceful parting of ways. Today, those same elitist voices of and for civil society who are calling on reforms in Belarus and Cuba and Myanmar (they know who they are so I need not mention them by name) remain silent about the growing illiberal and antidemocratic, xenophobic nationalistic trends in their own and our own homesteads as in the "land of the free." These semiretired statement givers keep themselves busy by denouncing the Russian president's penchant for autocratic rule. They sound like paid shills parroting Washington's demands for "democratic reforms." Maybe they should adjust their loudspeakers and their rhetoric, as their calls seem vapid and vacuous, if not highly hypocritical, in view of what is happening under their own roofs and in the rest of the West now. Throughout the 1990's huge doses of "shock therapy" prescribed by Jeffery Sachs (a disciple of Marx's nemesis Milton Friedman) were introduced to the region, which was still reeling from the events of 1989. It was meant as a quick cure to a state-controlled economy and was administered by local adepts such as the Czech prime minister at the time (and now president) Vaclav Klaus. Similar remedies were administered throughout central Europe and further eastward. The Czech-Slovak case in a sound bite was this: the federation was dismantling and then its two successor states began selling off their most valuable assets to Western corporate interests (fire sale-style) in waves of mass privatization. This was just what Sachs, from Harvard, and the International Monetary Fund and World Bank, in Washington, ordered. The repercussion of that shock treatment is still felt today in central Europe and beyond, as Naomi Klein so eloquently points out to us in her latest and best book to date, The Shock Doctrine: The Rise of Disaster Capitalism. And one of its human guineas pigs, as she would point out, was Robert Dziekanski, who was shot with Tasers and died at Vancouver Airport in October. Of course there are millions of other ailing or already dead patients like him, who were or are displaced—nameless migrants from Africa and Central America crossing borders in a search not just to live better but to survive as well. The sudden death of Dziekanski was immensely symbolic. He was a newcomer to the "new world" founded by immigrants—and a victim of "excessive force" and gross incompetence much more than he was a "fall guy" for our troubled times—driven not by hope for the future (as were previous generations of immigrants to America and Canada) but by fear mixed with paranoia and hysteria and fanned by the brigands, warmongers and con men we have elected. There are numerous ironies related to Dziekanski's tragic fate. The man did not come from a strange place as a refugee or an illegal migrant or from a perceived hostile place in the Middle East. He came to Canada from Poland as a legal-landed immigrant just as most of us from the war-torn and once divided but now reunited European continent once came to the "new world." This man was seeking a better life for himself. Perhaps this was his crime? He came to Canada like millions of others who seek to find work in Britain, France or elsewhere in the West. He came from a post-communist, post-modern democracy to an incredibly close ally of the United States in the war on terror; a nation with fallen troops on the ground in Iraq and Afghanistan still stubbornly loyal to the crumbling "coalition of the willing" and a member of NATO and the European Union; a nation whose millions of descendants are living in North America and some of whom have risen to the top levels of the U.S. government. Polish immigrant Zbigniev Brezinski is one example. He came first to Canada, and then settled in the U.S., where he went very far in the world: "Zbig" was the man who launched the first crusade in the West against Soviet Communism in the 1970s. Brezinski, like Dziekanski, came from one of the first nations to shed the shackles of a Communist one-party state; a nation that bred "men of iron" will and great faith like Pope John Paul II and Lech Walesa—two key figures who helped to bring the evil empire's days to an end. This is the great tragedy: to kill a man from a nation whose people and history helps us to fight tyranny to this day. As the wars on terror drag on, a de facto or undeclared state of emergency hangs over us or is being put into place. Perhaps another war in the Persian Gulf will suffice to snuff out all remaining remnants of civil society and be likely to reveal to everyone the true face of tyranny hiding behind that thin mask of anti-terror legislations. When that day comes we may all wake up to find it's too late to revive our democracy just like it was too late to revive a distraught man whose life was extinguished by a stun gun before the paramedics could arrive on the scene. In some sordid way, Dziekanski's last spasm of pain, his final anguished cries, which we all have seen and witnessed in high-tech and perhaps even in a somewhat voyeuristic fashion on YouTube, were the last gasps of our dying liberal democracies.